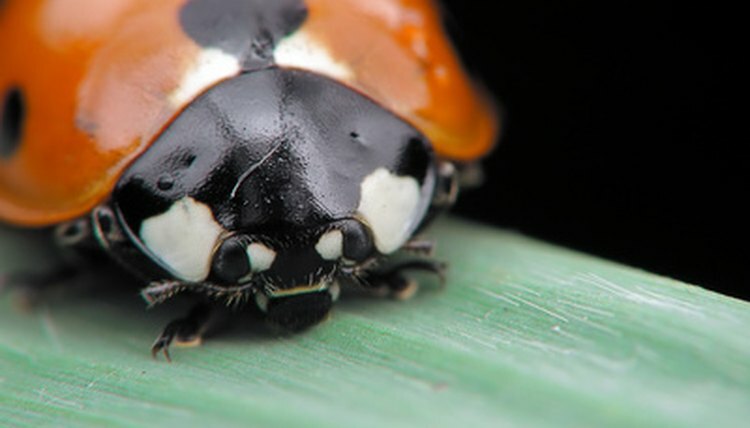 Ladybugs belong to the family of beetles called Coccinellidae. These dotted little darlings often take up residence in a shady garden spot or under your window's ledge. If you have the urge to corral one or more under your wing and raise them as pets in your home, go for it. They require minimal care and are easy to catch. They don't live too long, but as temporary pets go, they don't come much cuter. Choose a small container, approximately 4-inches by 7-inches, for your spotty friends. With a smaller abode, they won't have to search too far to find their food. Do a little planning before you catch too many ladybugs at once -- you may be tempted to keep a lot of them in the same container, but keep in mind they eat a lot for their size, and you'll have to provide more food to keep up with them all. Gently sweep your ladybug into the container with a small paintbrush. Place a lid with several small air holes onto the container. Place a leaf into the container for the ladybug to cling to. Dampen a paper towel, then add it to your ladybug's new home. Change the towel when it dries out. Ladybugs like moisture; they can stay hydrated from the water in the paper towels. Look for aphids in your garden, usually clinging to the underside of rose petals or leaves. Add them to the container. Alternatively, soak raisins in water and provide them to your new pets. Aphids are a ladybug's favorite treat, but soaked raisins may be more feasible and sanitary -- especially if you like to keep your home pest-free. Release the ladybug outside during the springtime so it can find a nice comfy spot for the next winter season. Ladybugs hibernate from winter to spring.  Ladybugs often roll over and "play dead" when threatened. If your ladybug appears to be dead, wait a few minutes. "Creeply Crawlies"; Alvin Silverstein, et al. Elle Smith has been an advertising professional for more than 25 years. Her work for ABC, CBS and Sony Pictures Television has appeared on radio, on air, in print and outdoors. In addition, Smith has more than 20 years experience in marketing, graphic arts, commercial photography and print production, and is a licensed real estate agent with property management certification in California. Why Do Caterpillars Spin Silk? How Long Do Ladybugs Stay in the Pupa Stage?